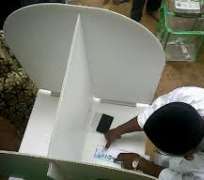 There was impressive turnout of voters during the chairmanship and councillorship elections in the remaining 15 local government councils of Kwara State on Saturday. The elections were also peaceful in all the areas visited by our correspondent. Though there were delays in accreditation in some polling units at Asa Local Government Area, where our correspondent monitored, the electorate waited patiently and commenced accreditation when the materials arrived. The Speaker, Kwara State House of Assembly, Mr. Rasak Atunwa, who was accredited at 10:30am voted at 12.10pm at Efue/Dongari/Iberekodo Ward 002 at Berikodo-Dongari Local Government Education Authority. He expressed satisfaction with the turnout of voters and their orderly conducts of the police and electoral officers, whom, he said, exhibited professionalism and thoroughness. 'The opposition parties in Kwara State are dead. They are no where to be found. It is not because that they do not wish to have a presence but the fact is that Dr. Bukola Saraki has been a benevolent, kind and magnanimous leader in politics and he is a man who carried people along and he shows love to the general populace. 'Therefore people are willing to identify strongly with him. Opposition parties should learn from that and imbibe the culture of tolerance in our politics,' he said. Reports from other parts of the state indicated peaceful elections. Kwara State Governor Abdulfatah Ahmed who voted at Share Ward 1 Polling Unit, Alebiopan compound, Share, Ifelodun LGA, urged winners to practise politics of inclusion. Ahmed, who reportedly cast his vote at about 10:50am, said the elections were peaceful and orderly. 'From what I have seen, I want to thank God for today because we have witnessed every process of the election going on accordingly and timely and most importantly peacefully,' Ahmed said.